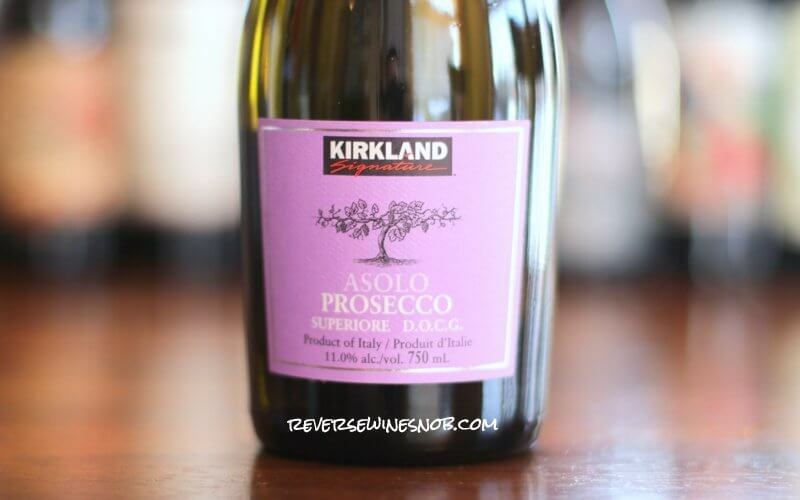 A deliciously affordable bubbly bottle from Costco, the Kirkland Signature Asolo Prosecco Superiore DOCG. Prosecco sparkling wine made with the Glera grape from Asolo, Veneto, Italy. 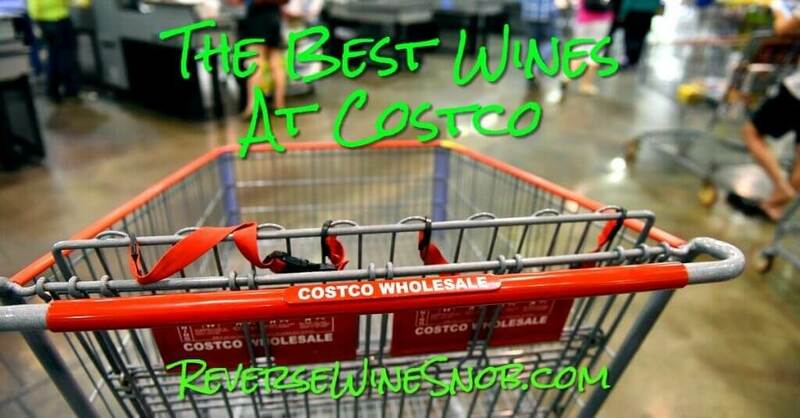 The Kirkland Signature Prosecco is available exclusively at Costco for just $6.99. It is imported by Misa Imports. From prime estate vineyards in the historic Veneto regions, Kirkland Signature Asolo Prosecco Superiore D.O.C.G. comes to life with the best grapes cultivated with passion in a magnificent territory close to the Italian Alps. A typical and always contemporary Italian sparkling wine, suitable for all occasions. Salute! Despite the extremely low cost, this Kirkland Signature Asolo Prosecco Superiore is a DOCG (Denominazione di Origine Controllata e Garantita) level wine, the highest classification of Italian wines. (The other levels are DOC, IGT and finally Vino di Tavola.) The DOCG classification for Prosecco includes the Asolo Prosecco region (also known as Colli Asolani) as well as the regions of Conegliano Valdobbiadene. Today’s wine hails from the former which lies near Treviso at the foot of the Alps. The Prosecco name used to refer to the grape, which is now known as Glera, but in 2009 Italy changed the name to refer to the region as a whole. However, just like with the name Champagne, other areas of the world (Australia in particular) are not quite on board and are resisting changing the name of the grape to Glera for the wines they sell in the EU. Regulations require Prosecco to be made with at least 85% Glera. Other varieties allowed include Verdiso, Bianchetta Trevigiana, Perera, Glera Lunga, Chardonnay, Pinot Bianco, Pinot Grigio and Pinot Noir. 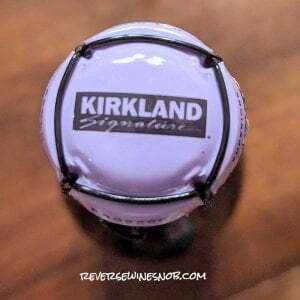 There’s no indication if any of those other varieties were used to make this Kirkland Signature Prosecco. Like Champagne and other sparkling wines, Prosecco can be made in Brut (<12 g/L of residual sugar), Extra Dry (12-17 g/L of residual sugar) and Dry (17-32 g/L of residual sugar) forms. Strict production rules must also be followed which include low yields per hectare which naturally limit the number of bottles that can be produced. One difference from Champagne is that Prosecco is made using the Charmat method where the secondary fermentation that creates all those delicious bubbles happens in large pressurized tanks, versus in each individual bottle. It’s easy to see how this method can be much more economical than fermentation in each bottle. Does this necessarily make the wine better? That’s up to the taster. Prosecco has enjoyed a huge rise in popularity over the last few years. It only takes one sip of this $7 Kirkland Signature Asolo Prosecco Superiore DOCG to see why. It begins with pleasing aromas of citrus, apple, some floral notes and a bit fresh baked bread. Tasting reveals a crisp, fruity and delicious wine with lots of fine bubbles. Caramelly nutty notes lead into the refreshing, dry finish. This one is made Extra Dry (medium level of sweetness) but it doesn’t feel sweet at all, just nicely fruity and delicious. Great for mimosas or on its own! At this price there’s no reason not to have some on hand. The post Kirkland Signature Asolo Prosecco – $7 of Fun appeared first on Reverse Wine Snob®.